Mexico’s new president, Andres Manuel Lopez Obrador, greets the crowd at the end of his inauguration ceremony, Mexico City, Dec. 1, 2018 (AP photo by Eduardo Verdugo). 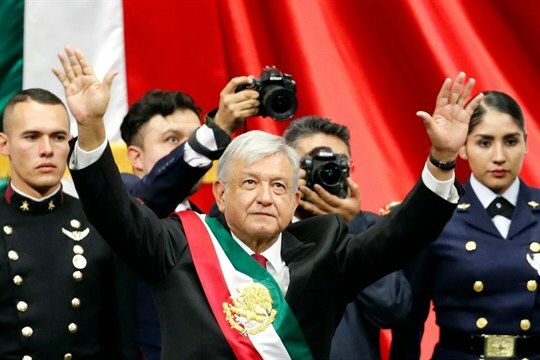 MEXICO CITY—Andres Manuel Lopez Obrador was officially sworn in as Mexico’s new president on Dec. 1, but for many Mexicans, it seemed as if he had already taken office months ago, eager to shake things up. Near-daily press conferences on the steps of his Mexico City apartment building, promises of informal popular referendums on any number of policy issues, and a notably antagonistic stance toward both opposition forces and the media suggest a new era of uncertainty for Mexico.